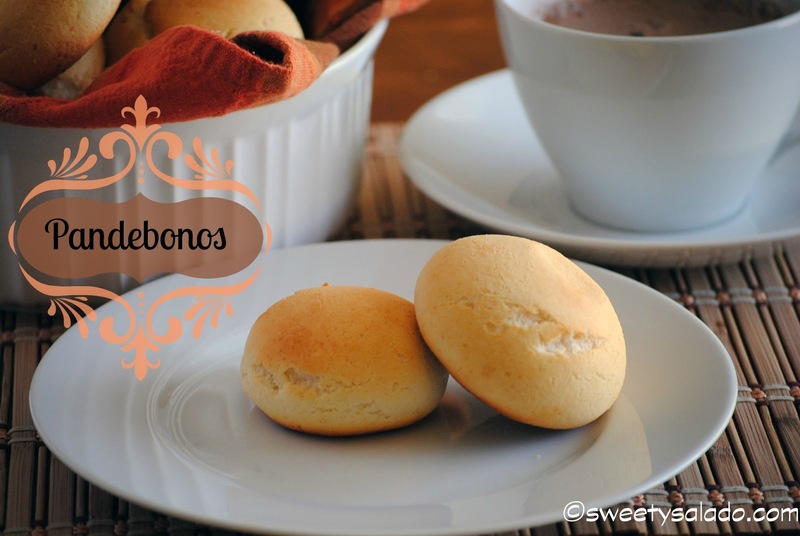 Pandebonos, another staple of Colombian cuisine, and just like buñuelos, you will find them being sold and made everywhere in Colombia which is probably the reason why most of the recipe requests I get are for this doughy piece of heaven. 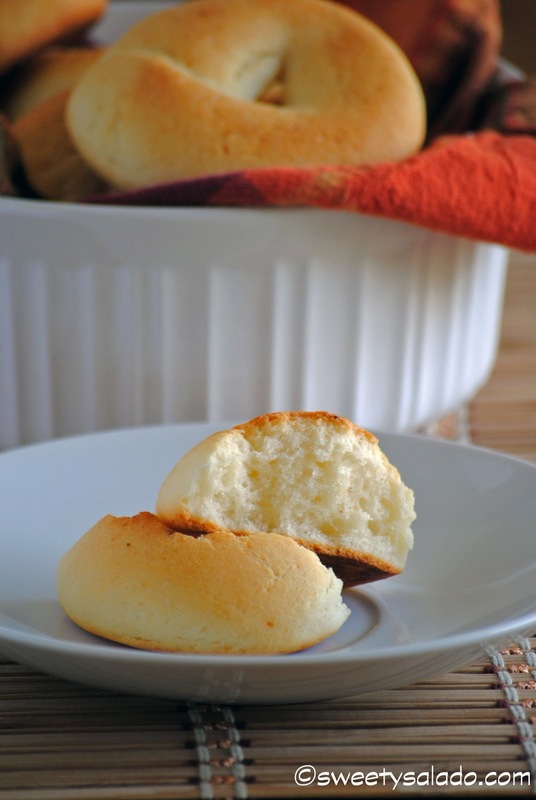 There are many different versions of pandebono all over Latin America and they all have different names depending on where you are like pan de queso, chipá (Argentina) and the most famous of all, the Brazilian pão de queijo. Now, why are they called pandebonos in Colombia? Legend has it that these were first made by an Italian man living in el Valle del Cauca who made these delicious treats and used to sell them out on the street while yelling “¡pan de buono!” (good bread!). Now, I’m not sure if there is any truth behind that story but it does have its romantic touch, so I’m sticking to it. And just like there are different names for cheese bread in Latin America, there are also many different ways and recipes to make them, some will have more ingredients than others, some will use different ingredients, less ingredients, what have you, but what they all have in common is the use of cassava flour and cheese. The ingredients to make Colombian pandebonos are very similar to the ones used to make Colombian buñuelos because you need cassava flour, as well as queso costeño. And, just like I said in the buñuelos recipe, since this type of cheese is only found in Colombia, we’re substituting it with queso fresco and feta cheese. You will find that the combination of these two cheeses is perfect for making these. You will see that these pandebonos will transport you back to Colombia as soon as you take them out of the oven and serve them on the table. And if you have never had a pandebono, you will see how wonderful they are. 1. Pre-heat oven at 425ºF (220ºC). 2. In a food processor add cassava flour, pre-cooked cornmeal, baking powder, sugar and salt. Pulse a few times to mix all ingredients well. 3. Now add the queso fresco, feta cheese, butter, egg and mix a few seconds to incorporate them with the dry mix. Now add the milk slowly, little by little until you get a soft dough. 4. Form small balls (about the size of a golf ball) and place them on a cookie sheet lined with parchment paper. You can also roll out the ball to make a string about ½ inch (1 cm) thick and pinch the ends together to end up with a bagel looking pandebono. 5. Bake pandebonos for about 20-25 minutes or until golden brown. Serve immediately. I love your website and I am going to try your arepa recipe this weekend. My husband is Colombian but I am not so I am so excited to find your website. I have made empanadas before and they turned out good but it so hard to find good Colombian recipes on the internet. Thank you so much for the wonderful recipes and videos. I can't wait to try them all!!!! AHHH I can't wait to make these for my Colombian husband! Thank you so much for making such an awesome blog! I wanted to make pandebono but I couldn't find cassava flour or starch, instead I used potato starch, which is pretty common here in the US, and the pandebonos turned out really good!! !Thank you so much for the recipes!!! What a great tip! I never thought of using potato starch, but it does make sense. Thank you! My mix is still liquidity what should i add more of?? ?….or should i do it over again? ? Hi Abby, you can add more of the cassava starch little by little until it's firmer. Next time mix all of the dry ingredients first and then add the milk about 1 tbsp at a time until you get a soft but firm consistency. Some times the cheese we use has more water than others or we use larger eggs and that's why we don't need to use a lot of milk. That's happened to me a few times when making buñuelos, after I mix everything I find that I don't need to add milk at all and some times I end up using almost a ¼ cup of milk, it all depends on the ingredients and their water content. Hi , question: the dough can be save in the fridge overnight and prepared in the oven the next day? Hi Aura, I've never made the dough the night or day before because it's so easy to put together right before baking but I don't see why you couldn't do it if you wrap it really well, just like pie dough. It may be a bit dry though but you could probably make it soft again by adding a little bit of milk. Hi, Diana,I have made up a batch the night before. I split it, wrap the balls in plastic and put one half in the freezer in a freezer bag or other resealable container, and the other overnight in the fridge to bake the next morning. The frozen pandebono dough will thaw overnight in the fridge. I bake them in our toaster oven at work and my staff loves 'em. Diana,I just want to be clear. I didn't freeze or refrigerate the individual pandebonos. I split the large dough ball into two spheres and then did the wrapping/freezing. I make the individual pandebonos right before baking. Después de todo, ¡esto es cuestión de pandebono! I made them tonight for my 1st son's birthday party and it was amazing, really the real pandebono, one of my favorite Colombian food and so easy to prepare, I really love them, thanks to sweetysalado. 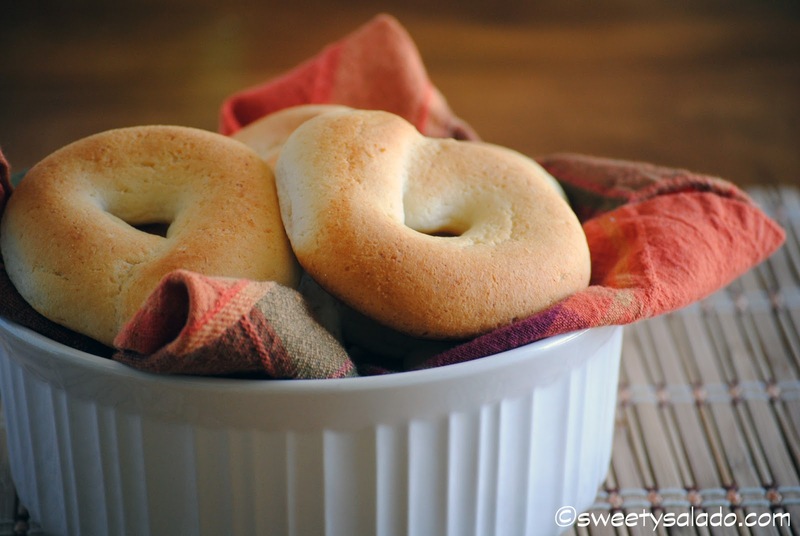 What is your favorite feta cheese brand to use for pandebonos? The one I bought was too salty. Hi Karen, yes, there are many salty brands of cheese and it takes trial and error to find a good one. For the queso fresco I always like to use Cacique Ranchero which is their queso fresco and it's delicious. And for the feta cheese I like to use the crumbled feta by Treasure Cave. I usually buy both of them at Walmart but most grocery stores in the US should have them. No, not at all. They can easily burn but you have to keep your eye on them. heat 1 gallon milk to 185 degrees, take off heat, add 3/4 cup vinegar, give a couple swirls with a big spoon, let rest 1 hour, pour off whey through a colander, let cheese slide into colander, let drain about an hour…you should have about 1 1/4 lbs unsalted queso blanco aka farmers cheese. I made these yesterday and they came out great. My husband is Colombian and he said they tasted like they came straight from a Colombian bakery! I agree. The only problem I had, if it's a problem at all, is that they spread out a bit too much. I shaped them into balls but they looked kind of flattened. Any way to prevent this? Thanks for the reply Diana! I thought I needed to chill the dough before baking but I'll try making them drier with the next batch at your advice. I love your blog by the way! The recipes are great and the photos beautiful. Lo intente creo que me pase de leche, me hubiera gustado saber la cantidad que uso usted. Termine h echando más harina de yuca y los puse en un muffin pan porque no era lo suficientemente thick la masa y salieron bien pero no sabría si llamarles pandebono 😉 salieron bien rellenos de queso 😉 usé baking soda y crean of tartar en lugar de baking powder y use garlic parsley salt (salud) me alegro que salio bien aún con leche 0% fat y lactose free 😀 tenía un poco de miedo. Gracias por la receta. Bendiciones. Cristo viene y es él camino y la vida, la única manera de escapar la ira venidera de Dios, si quieres ser salva conoce a Cristo mediante Su Palabra, la Santa Biblia ♡. Tu morada eterna depende de ello. Un día esto es lo único que importará. Dios te bendiga! Hola, la cantidad de leche siempre varía dependiendo de qué tan grandes está el huevo y qué tan húmedo está el queso. Muchas veces no necesito agregarle leche para nada y otras veces le agrego hasta 3-4 cucharadas, pero se las voy agregando poco a poco hasta que obtengo la consistencia que necesito. Hi Diana. I tried this recipe, the pandebonos came out great. After baking they were a little dry in the outside do you have an idea why this could happen? One more question, what size is your food processor? Hi- Is there a specific cassava flour brand you recommend? Thank You. Hi there! Yes, I love either the Yucarina brand that you find in Colombia and some Latin stores or Goya. Hello. I made your recipe for Pandebonos (found all the ingredients at my local grocery store). I wanted to make them for my daughters Columbian Aupair. She and her girlfriend loved them. Thank you so much for making it possible to bring a small taste of home to these two wonderful girls! Some people have told me that potato starch has worked for them, but I haven't personally used it. Cornstarch will not help them rise like cassava starch or flour. Not sure about rice flour because I have never used it. However, some people have told me that potato starch or flour worked for them really well but I haven't used it myself. Hello….I must commend you on the wonderful amojabana recipe. I've made them twice in ten days. So content..the colombian bakery that we use to purchase from has been taking cut back on the cheese and they are dry. Thanks to you I can make at home when ever I want. Will you also have a video for colombian yuca bread anytime soon? Hello Luz, thank you so much for making the recipe! I'm really happy to hear that you're enjoying making it at home. I do plan on posting the recipe for the pandeyuca recipe but don't know when I'll have time to make the video. But I'll try to do it this year, I promise. I've been looking for a recipe for empanadas de cambray con quayaba and I've read that the dough for empanadas de cambray and pandebono are the same. Is this true? Can I use the recipe to make the empanadas de cambray and stuff them with some guayaba before baking? I have heard that you can use the pandebono dough to make empanadas de cambray but I personally haven't made them that way. I have also heard that you can use the almojábanas dough to make them, which I also haven't used to make them. Hello �� I need help; how many times do I pulse, and how many minutes do I process? It depends on your food processor. I only pulse a few times until it all blends in. You can also knead everything with your hands until you get a soft, smooth dough. Hi Carolina, since these pandebonos are homemade, they will tend to harden once they get cold because of the cassava flour. You can try storing them in a resealable bag or airtight container to see if they last fresh longer. You can also heat them in the microwave to soften them again. Hola! I have used your recipes before and have had great success! This time not so much. The pandebono was hard, not burned just hard. The flavor was great! I followed the recipe, what could I have done differently? Tus recetas son espectaculares, también estoy en el extranjero y gracias a ti extraño un poco menos. Quiero comentarte que lo que se conoce aquí en Argentina como Chipa, es más bien el Pandeyuca, chicloso y tostado por fuera. Quiero agradecerte por compartir y ayudarnos a los migrantes a dar a conocer un poco de nuestra cultura. Abrazos! Hola!!! Mil gracias por tus recetas hace muchisimo no me como un pandebono y vivo fuera de colombia. Cuando tu dices queso fresco qué otro tipo de queso puedo comprar? Mil gracias de verdad que encontrar tu canal due una bendición. Excelente receta! Acabo de hacerla y a mis vecinos ecuatorianos les encantó y yo encantado de haberla hecho bien, solo quería probar que podía pero en términos económicos me sale mejor comprarlo en la panadería Colombiana que me queda cerca. Gracias y éxitos en todo. It could be for many reasons, one of them is the amount of cheese vs tapioca flour. If you have more cheese or if it's not dry enough, you will have too much water in the dough and it will flatten during baking. So make sure the cheese you're using is not too watery and that you're using the right amount for each ingredient. Also, make sure the egg you're using is large and not jumbo because that will also add too moisture. The last tip would be to shape them really round so they can keep that shape longer as they bake. Hola estoy feliz con tu blog, mil y mil gracias!!! Quiero preguntarte si el queso fresco de la receta puede ser reemplazado por el queso mozzarella? (vivo en Viena, no queso fresco por estos lados), si consigo el feta. Vi la version 2 del pandebono que es solo con mozzarella, pero me llama mucho la atención usar el feta en combinación con el mozzarella, crees que funcione? De antemano gracias por tu atencion. Hola Andrea, el queso feta es más que todo para darle el olor y sabor añejo que suelen tener y si quieres lo puedes combinar con el queso mozzarella. Lo malo de usar solo el queso feta es que tienden a quedar demasiado secos, pero recalco que el queso feta que consigo en EE.UU. es seco y de pronto diferente al que puedas conseguir en Viena.